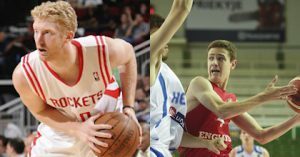 Chase Budinger of Baskonia and Cam Bett from Ridley College come on Taking The Charge to talk hoops and more. Taking The Charge Podcast Episode 237: Very brief look at the NCAA Final Four and then take a minute to talk about Lavar Ball. Then it’s interview time with Chase Budinger from EuroLeague team Baskonia and then English junior NT player Cam Bett of Ridley College in the Toronto metro area. Episode 237: A brief look at the NCAA Tournament and Lavar Ball.